Eva was born in Mauthausen concentration camp, Austria, on 29th April 1945. She and her mother are the only survivors of their family, 15 members of whom were killed in Auschwitz-Birkenau: three of Eva’s grandparents, her father, uncles, aunts and her 7-year-old cousin, Peter. In 1933, when Hitler came to power, Eva’s father Bernd Nathan left Hamburg for Prague where he eventually met her mother Anka Kauderová. The couple married on 15th May 1940. In December 1941 her parents were sent to Terezín (Theresienstadt). They were to remain there for three years, which was very unusual: they were young, strong and well able to work. During this time, and despite the sexes being segregated, Anka became pregnant with a son, Dan. When the Nazis discovered this fact, Eva’s parents were forced to sign a document stating that when the baby was born, it would have to be handed out over to the Gestapo to be murdered; it was the first time her mother had heard the word 'euthanasia'. However, in the event, her brother died of pneumonia at two months of age. And his death meant Eva’s life – had Eva’s mother subsequently arrived in Auschwitz-Birkenau with a baby, she would have been sent immediately to the gas chambers. But because she arrived there without a baby and although by this time she was again pregnant with Eva – but not visibly – she survived. Eva’s mother was in Auschwitz–Birkenau from 1st-10th October 1944. She had, incredibly, volunteered to follow her husband who was sent there. Tragically, she never saw him again and he never knew she was pregnant. She discovered after the war that he had been shot on 18th January 1945 – less than a week before the liberation by the Red Army. As Anka's pregnancy was not visible and she was deemed fit for work, she was sent out of Auschwitz to work in an armaments factory in Freiberg, near Dresden. She was to remain there for the next six months – by now getting weaker while at the same time, becoming more visibly pregnant. By the spring of 1945 the Germans were retreating and evacuating concentration and slave labour camps. Eva’s mother and her fellow prisoners were forced onto a train: not cattle tracks this time but coal trucks – open to the skies and, obviously, filthy. They weren’t given any food and scarcely any water during what was to become a 3-week nightmare journey around the Czech countryside. The Nazis didn’t know what to do with their 'dying cargo'. The train eventually arrived at Mauthausen concentration camp. Anka had such a shock when she saw the name of this notorious camp that her labour began and Eva was born on a cart, in the open, without any assistance, medical or any other kind. By this stage, Anka weighed about 5 stone (35 kg) – she had the appearance of a scarcely living pregnant skeleton. And Eva weighed about 3lbs/1.5 kg. If the camp's gas chambers hadn’t been blown up on 28th April 1945 and the Americans hadn’t liberated Mauthausen just days after Eva’s birth, neither mother or child would have survived. Eva and her mother returned to Prague, where Anna married Eva’s stepfather in February 1948. In the same year they emigrated to the UK and settled in Cardiff. 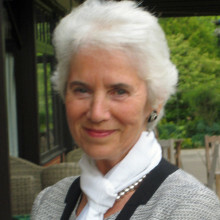 Eva married an academic lawyer in 1968, has two sons and has been living in Cambridge ever since.